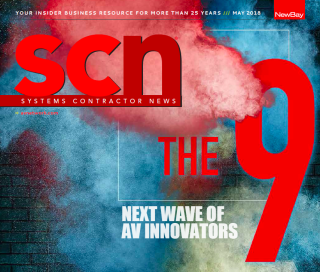 Steve Jobs once said, “Innovation distinguishes between a leader and a follower.” This year’s class of SCN’s The Nine features young AV professionals who are leading the way into the next iteration of the AV industry. As Lindsey Adler, then editor of SCN, said in 2016, “The Nine isn’t your typical ‘Forty Under 40’ list.” The Nine encompasses a generation of AV leaders who have already started to change the industry. There’s Luke Jordan, who revamped and spearheaded AVIXA’s Integration Council at the ripe old age of 27. There’s Alesia Hendley, who’s taken the power of social media to the next level and even has Baby Boomers upping their social game. The one central theme we discovered while interviewing this talented group was the power of adaptability. Adaptability has translated to success at a young age. Whether it’s the willingness pick up a new skill like Chase McCloud did when he learned how to create 3D rendering for events, or modifying your working style to accommodate exciting ideas from clients like Elizabeth Newton, the ability to change quickly and easily is a recipe for a success in the ever-fluid world of AV.